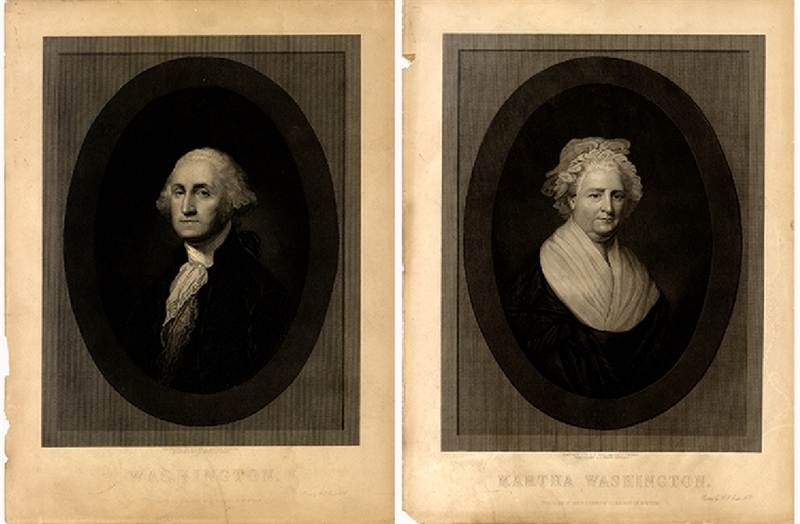 Prints of President George Washington and Martha Washington, each 12” x 15-3/4”, slight dark (could be cleaned) minor edge damage will matte out, VG. Titled “WASHINGTON” shows George Washington, head-and-shoulders portrait, facing slightly left, in oval with printed rectangular frame. Engraved by H.B. Hall and G.E. Perin, painted by Gilbert Stuart. Published by Geo. E. Perine, No. 111 Nassau St. New York, Printed by H.E. Coats. ... plus the mate, “MARTHA WASHINGTON” with the same credits. ND, c1870.